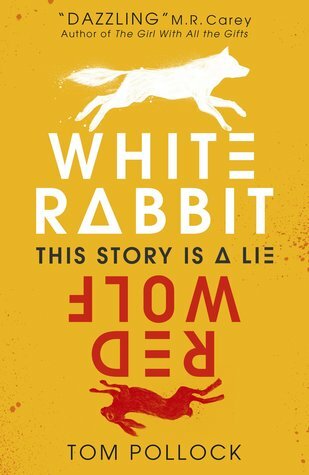 White Rabbit, Red Wolf by Tom Pollock (proof) - Peter Blankman is afraid of everything and must confront unimaginable terror when his mother is attacked. 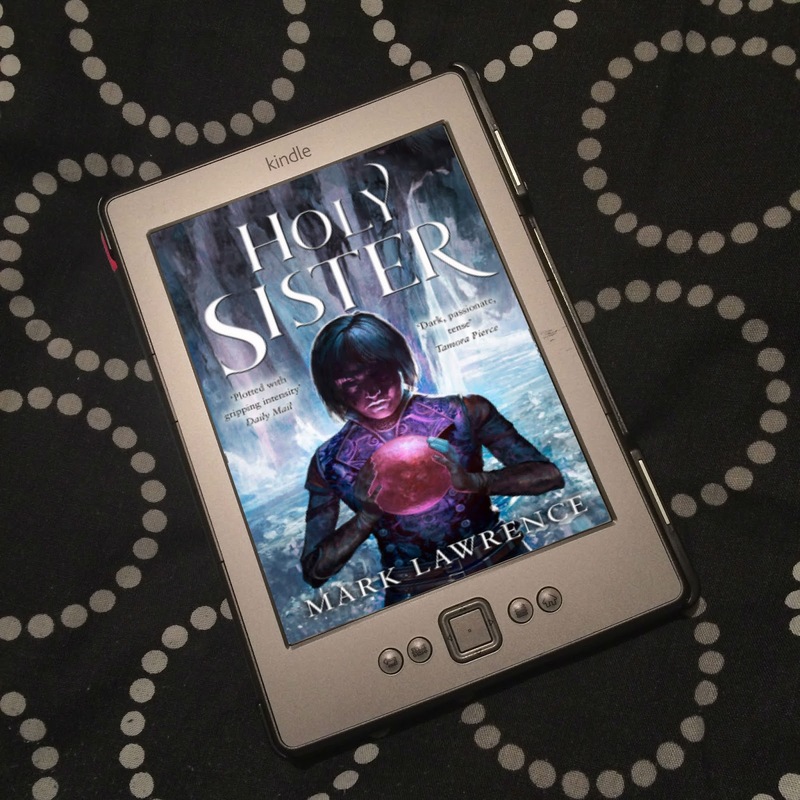 I received this eProof for free from Walker Books via NetGalley for the purposes of providing an honest review. Trigger warning: This book features a suicide attempt. 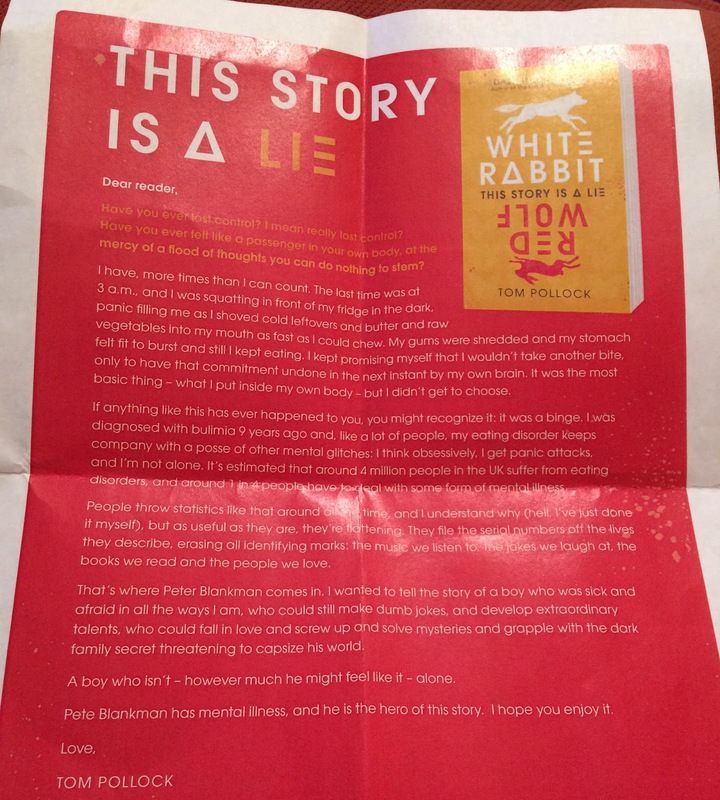 When I received a proof copy of White Rabbit, Red Wolf by Tom Pollock, it wasn't the description that immediately had me wanting to pick this book up, but the letter that Tom Pollock wrote to the reader that was included in the press release. In the letter, Pollock is very honest about what having bulimia looks like for him, but also how he wanted to write a story about a boy who was afraid like he is, but still got to be the hero of the story. As someone who has anxiety, reading the letter, all I could think was, yes! 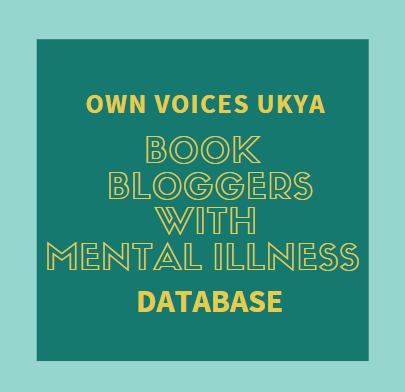 It's not often that we get YA novels featuring a protagonist with mental illness, where the book isn't about mental illness. There are a few, but they're pretty rare. I was a little put off by the espionage aspect of the story, because that's not generally my thing, but a character who was mentally ill but also the hero? There was no way I wasn't going to read it. And oh my god, it was absolutely incredible! There is so little I can actually say about the plot of this book, because nothing is as it seems. Peter, a mathematical genius, has a panic disorder that affects his day-to-day life. His mum, a scientist, is going to receive an award for her work, but he is absolutely convinced he's going to ruin it by having a panic attack - which, of course, causes him to have a panic attack. When he runs off, his mum tries to chase him, to help him, but instead, she's stabbed by someone unknown, and his whole world is turned upside down. Who attacked his mum? Why did they attack his mum? And how comes she never told him or his sister Bel there's much more to her job than they ever knew? Nothing he thought he knew about his life is true. White Rabbit, Red Wolf is seriously clever. There is twist after twist, and you never know exactly what is going on. You think you've got a handle on what is what, but then, out of left field comes another twist. My jaw literally dropped more times than I can count. And it's not just that I never saw the twists coming, some of those twists are emotional sucker punches that throw you for a complete loop. Peter never knows who to trust, and he is struck with betrayal after betrayal. On more than one occasion, it was incredibly heartbreaking. It's like someone is coming at Peter's life, and is chiseling away at it, revealing the truth, and the hurt that comes with it. But we the reader never know who to trust, either - even Peter. The tag line for the book is "This story is a lie," and it's clever word play on something in mathematics that crumbled Peter's belief in the fact that maths can solve anything, but also hints at that the reader can never necessarily believe what they're reading - that Peter himself might not be entirely forthcoming, or reliable. It's told in alternate chapters of present day, and chapters from some time in the past - a memory of Peter's that is sparked by something happening in the now. Sometimes a present day chapter will end on a shocking revelation coming from Peter himself, and in the following chapter, we'll see exactly what he's talking about. Peter's not hiding things, exactly; he doesn't always put two and two together until he gets additional information. Certain things from his past don't necessarily mean anything - things he wouldn't even think about - until he's told or works out something. And then things start to slot into place for him, and he hits us with a humongous plot twist. Seriously, with this book, I never really knew which way was up, and after so many twists, I learnt not to necessarily believe everything I was reading, because another twist would come along at some point, and throw a spanner in the works. But that's the only thing I knew - a twist would come, but I'd have no idea what that twist would look like. There are no theories to be had in this book, at some point you just have to give up trying to figure things out, because you're never going to get it right. And it was brilliant! The twists are just mind blowing! So unpredictable, and I was absolutely gripped! There are aspects of this book that are seriously messed up. It was so unbelievably chilling at times. When certain things were revealed, my blood ran cold. Some of the twists aren't just mind blowing because they're clever and unpredictable, or because they're heartbreaking, but also because they are incomprehensible. There is a dark, sinister element to this story that just gets worse as it goes along. There were moments where I was just thinking, "What. The. Hell?!" in utter disbelief. White Rabbit, Red Wolf really has a bit of everything. And Pollock has done such an incredible job with this book. This is not a book that Pollock could have written by the seat of his pants. This book was obviously planned out in meticulous detail. Meticulous. There is no detail in this book that is unimportant. Not one. It might seem like it in the moment, but later on, you find that everything is important. Everything will eventually be a clue to something. Not only is this book super clever because of all the twists, but because of all the maths, too. If Pollock isn't really into maths himself, then he did a serious amount of research for this book. How Peter is able to use maths in order to figure things out is just astounding. Yes, it's complicated, but Peter is used to explaining complicated maths to non-maths geniuses, so us readers are not going to get lost. But even so... man, the amount of work that this book must have involved. It's just unbelievable. And that ending! Don't even get me started on that ending. It knocked me completely for six! 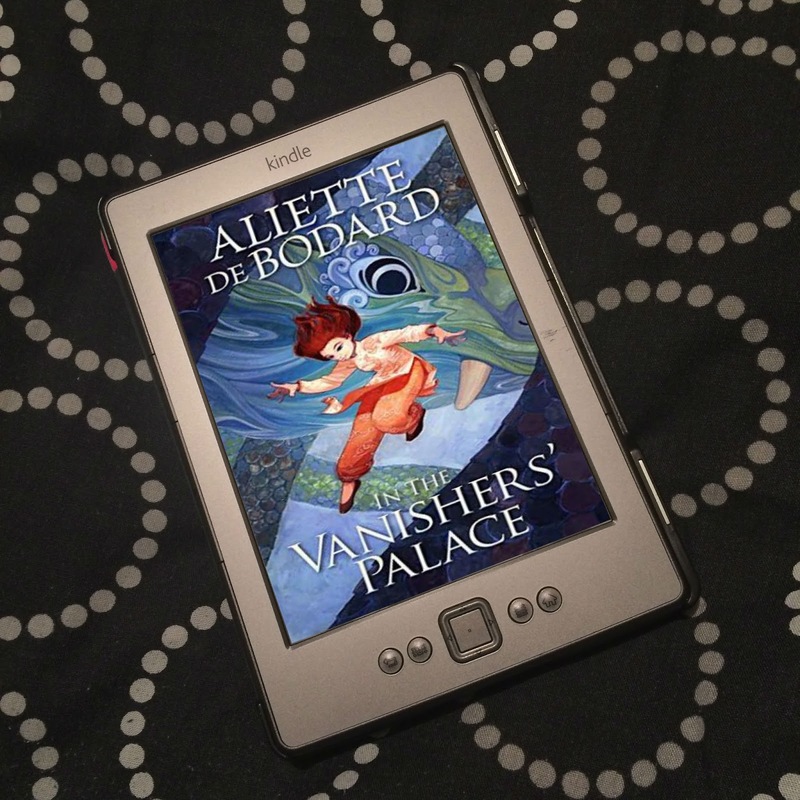 I finished reading wanting to immediately start all over again, and pick up on all the tiny details, but especially certain parts of the book, because of the revelations at the end that make you question what happened earlier on. I just wanted to shout, "But what about X, Y and Z?! How?! How?!" I am in so much awe of Pollock for crafting a story so tight, with so many twists, where everything is intertwined and so complex. I was constantly kept guessing, and I couldn't put it down. I absolutely loved Peter. As I said at the beginning of my review, Peter has a panic disorder, and struggles with crippling anxiety. He is scared pretty much all the time, and there are triggers everywhere. We get a good look into Peter's life and how his anxiety effects him in the chapters of his memories, but the opening chapter shows us just how bad he can get. He's in the middle of a binge. He has various methods of how to cope when he's having a panic attack; counting, or rather, doing some serious mental maths; talking, saying out loud all the things that are going through his head; moving, getting up and walking or running, and finally, when he can't fight it, binging. He feels this great emptiness in his stomach that he has to fill, yet there is never enough to fill it. The opening scene of White Rabbit, Red Wolf is his mum coming across him, the kitchen a complete wreck from where he has raided the fridge and every cupboard, with him crunching on a salt cellar, shards of porcelain slicing up his mouth. It is a shocking and upsetting opening scene, but from the get go, you know just how much Peter's anxiety affects him. Having such crippling anxiety, it's like a constant companion, so although this isn't a story about mental illness, Peter's anxiety is present on every single page. It's a constant battle for him to not give in to panic, and he doesn't always succeed. With every shocking revelation, he is triggered. And yet... he is determined to help his mum, to try and work out what's going on, and figure things out. There are so many times when he could simply give up and give in, but he never does - even in the midst of a panic attack. It was so incredible to see, and filled me with hope. Although my anxiety is nowhere near as bad as Peter's, I still feel like I have no control over my body. I feel like I'm a ticking time bomb, and at any moment, I could go off, without warning. And my panic attacks are terrifying. So even when I'm doing ok, there's always a part of me that's worried about what might set me off. So seeing Peter, who is constantly battling his anxiety actually work his way through it, and achieve some incredible things, is just unbelievable. A boy with such severe anxiety, having to deal with what he's dealing with, and still go out and do all the things he needs to do - figuring out what's really going on, etc? It's incredible! There is one moment where he is having a panic attack at a very crucial moment, and every single second is a fight of it's own to resist doing the things that will stop or ease the panic attack in that moment - because he simply cannot risk the fallout that would come if he allowed himself to give in. And it's not easy, I know it's not easy, to fight, to not give in and do whatever you have to do to end it. It's so goddamned hard. But he does it; he fights - each second, he fights - in the worst of circumstances. It was so emotional to read, but I was hugely proud that he managed it. Yes, this is fiction, the story isn't real, but it's written by somebody who knows what this is like, and I know what it's like. And yes, it can be done, but I cannot stress how bloody hard it is. So yes, I was proud of Peter for fighting, and for continuing to fight, when it would be so much easier to give in, at a time when circumstances were dire. As someone who has anxiety, I can't tell you what it was like to read that. It's so powerful, and so, so important. I could really go on and on about how bloody brilliant this book is, but I think my review is probably long enough now. But White Rabbit, Red Wolf deserves to be huge. It deserves to win all the awards. It needs to be a movie. Can you imagine? A boy with such crippling anxiety, the protagonist in such a fast paced, mind blowing thriller movie? Can you imagine?! It would be astounding. I am so incredibly jealous of everyone who has yet to read this book for the first time, because you're in for one hell of a ride!